Every now and then I find myself looking back at older recipes here on the blog and am mortified by the awful pictures I took when I first started. 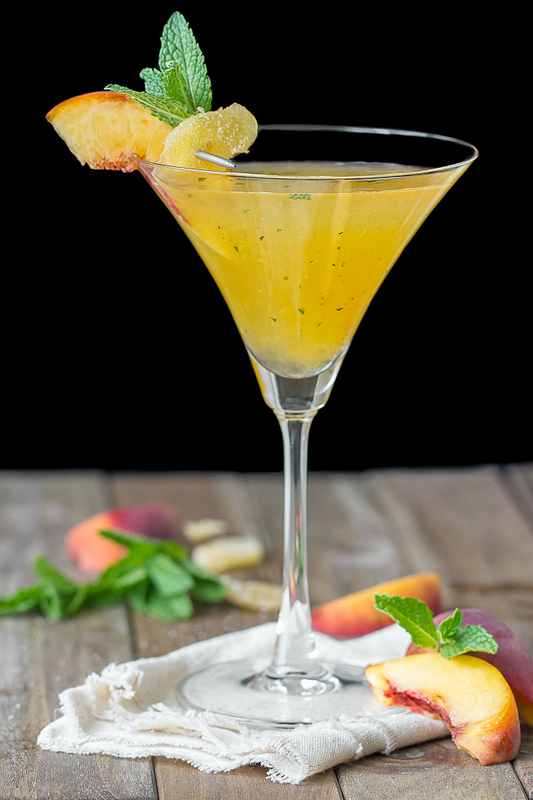 I still have a lot to learn about photography, but I’ve come a long way and this Peach Ginger-tini recipe is a perfect example. I still really, really love this martini, just didn’t love the picture. So when I made this cocktail last time I snapped a few new photos and thought it was a good time to share the recipe again. I encourage you all to give it a try. It’s a great Spring and Summer martini! I’ve been experimenting in the bar trying out some new martini cocktails using fresh fruit to shake things up a bit. This Peach Ginger-tini took a few experiments to get it the way I wanted, but I finally got there. And it’s really good! I was bound and determined not to be defeated by my failures so next time at the grocery store I bought some frozen peaches hoping they’d be tastier than the fresh ones. I also bought some peach nectar. I made a mint simple syrup. I knew what I wanted it to taste like, I just couldn’t quite get there. No worries though…it all eventually got drunk. I’m not one to waste! Finally, after much experimentation I have what I believe is the best of all my experiments (and how I’ve made them ever since). This Peach Ginger-tini is fantastic if I do say so myself. Cheers! Peachy with a little bite of ginger and cool, refreshing mint. Divine. Combine water, sugar and mint (chopped up) in saucepan. Bring to boil until sugar melts. Remove from heat and let cool. Strain syrup when cool to remove mint. Store in refrigerator. 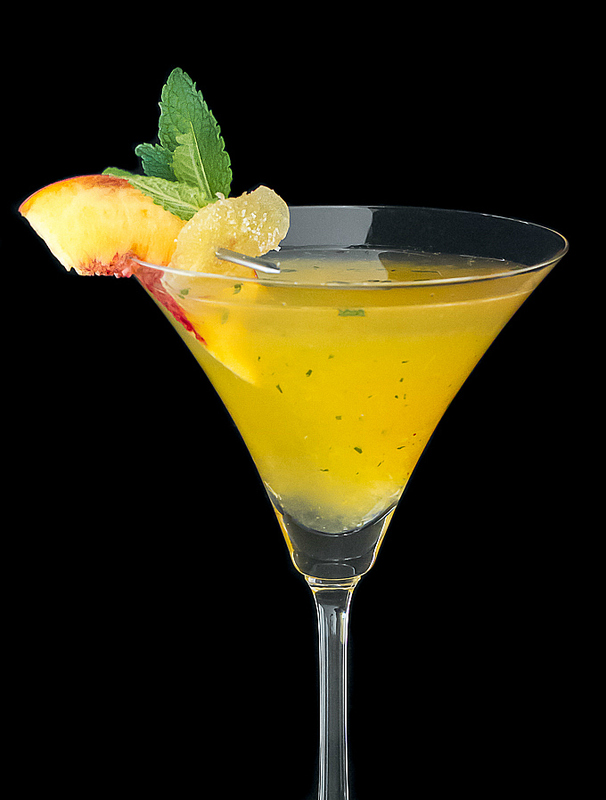 Muddle peaches and mint leaves in cocktail shaker with a generous splash of simple syrup. I like to add a bit of crushed ice to help break up the peaches and mint when muddling. Add vodka, ginger liqueur, and lime juice and shake well. Strain into chilled martini glass. *adjust the amount of ginger liqueur to your liking. Now, ready for the original picture? Yikes! I adore mint in cocktails. I bet it’s perfect with peach, this looks so refreshing! Mint has been making an appearance in a lot of my stuff lately, just love it! Oh yes, I have many cringe-worthy photos on my blog! Love the mint specks floating in this one. On the bright side, it’s nice to look back and see the progress, right? oh wow what a refreshing treat! I made this today and I LOVE LOVE LOVE the flavors! thanks! Happy to hear that! I love the flavor combo too! Love this! Peach is one of my absolute favorite flavors for cocktails!